Dubai: He’s attempting the impossible – to stop children from being afraid of going to the dentist! 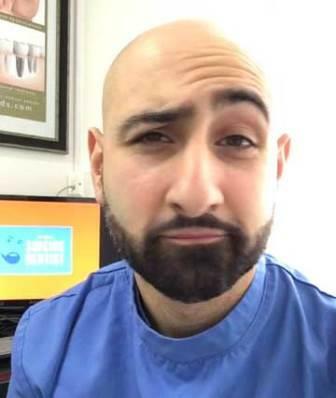 Dr Milad Shadrooh, known on social media as The Singing Dentist, rose to fame with his viral music videos, in which he parodies popular songs and gives them a dental twist. From ‘Shape of You’ by Ed Sheeran, to ‘Happy’ by Pharrell Williams, Dr Shadrooh has experimented with many new-age songs, and writes his own lyrics. What started out as a joke video that he sent to friends has ended up causing him to become a social media star, with thousands of followers on Facebook and millions of views on YouTube. Dr Shadrooh was in Dubai, participating in the International Dental Conference and Arab Dental Exhibition (AEEDC) this week, where dental professionals, specialists in the oral health industry and students are meeting to discuss the latest advancements in dental materials, equipment and methodology. For anyone who’s looking to better their dental hygiene, he has one word of advice on foods to avoid. In 2014, the World Health Organisation (WHO) released guidelines recommending that only five per cent of a person’s total daily calories should come from sugar, though they acknowledged that such a drastic cut might not be realistic. Dr Shadrooh said a good way to reduce the impact of sugar on your teeth is to rinse your mouth after eating, rather than brushing your teeth. Watch Gulf News’ Facebook Live interview with Dr Shadrooh for more tips on better dental hygiene.